E-Techco (Qianhai AnyCheck) expressed that it was hosted by the Shenzhen Municipal People's Government, the Shenzhen Development and Reform Commission, the China Council for the Promotion of International Trade Shenzhen Trade Promotion Commission, the Shenzhen International Chamber of Commerce, the Shenzhen World Trade Center, and the China International Chamber of Commerce. 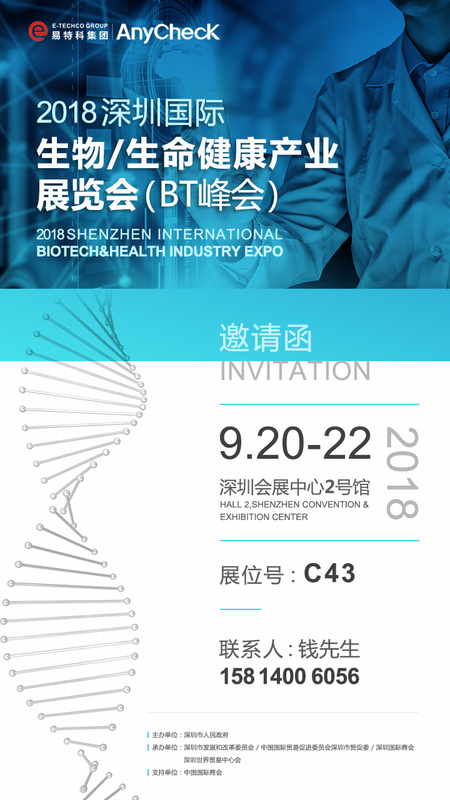 The 2018 Shenzhen International Bio/Life Health Industry Exhibition will be held on September 20th-22th, 2018 in Hall 2 of Shenzhen Convention and Exhibition Center. As a representative of Shenzhen High-tech Medical Technology Enterprise, E-Techco (Qianhai AnyCheck) attaches great importance to the Shenzhen International BT Leaders Summit. With the support of Mr. Zhang Guanjing, Chairman of the Board of Directors, Mr. Liu Wei, Vice President and General Manager of Marketing Department of E-Tech Group, Mr. Hou Yunchao, Senior Vice President and Executive Director of Marketing Department, will lead the market, channel and technical elite team to attend the exhibition, with the leaders of the exhibition, Experts and peers will give keynote speeches and high-end dialogues. At the same time, E-Techco (Qianhai AnyCheck) will build a large booth of over 90m2 at the booth C43 of the venue, exhibiting the AI of the company's safety and health integrated machine, the health and fitness model of TCM, and the four diagnostic instruments of Chinese medicine. Medical equipment, and report to the exhibition leaders and experts on the latest research results and solutions of our company in the biotechnology and life health industry. At the exhibition, E-Techco (Qianhai AnyCheck) invites leaders, experts and partners from all walks of life to come to visit and guide and experience exchanges. I believe that your arrival will definitely add luster to our company. The promotion of the implementation of the “healthy China” strategy in all regions of the country has made a greater example. E-techco group (Shenzhen E-Tech Investment Holding Group) registered capital of 1 billion yuan. And E-Techco Group (Qianhai AnyCheck) is a High-Tech enterprise with 15 years R&D and service background, which focuses on Internet & medical & health & geriatric service, and it is in the domestic and overseas leading level of biosensor, life searching and positioning, medical informatization, health management, chronic diseases prevention, TCM preventive medicine technology provider and service practitioner. The company HQ is located in Shenzhen, with branches based in Guangzhou, Beijing, Tianjin, Xian, Shijiazhuang, Fuzhou, Shanghai, Hong Kong, with overseas institutes in north Ireland, American Silicon Valley, Toronto and so on. The number of health management centers owned and operated by E-Techco increased to nearly 90. It has more than 650 grade-2&class-A hospitals, grade 3&class 1 hospitals, and all levels health and medical institutions. 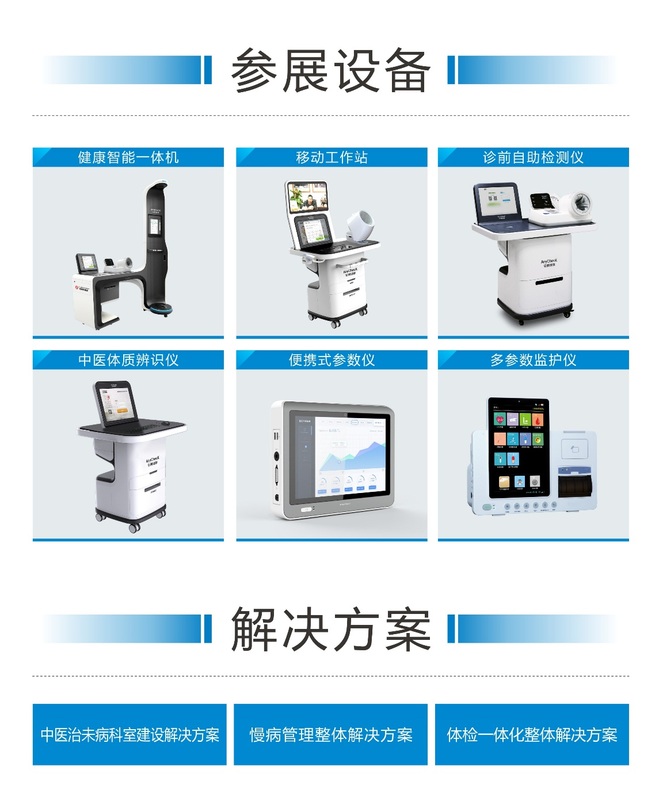 The national market have been fully opened, intelligent self-help integrated machine, internet & chronic disease management, internet & emergency, internet & TCM, cloud HIS and other medical informatization products have been widely acclaimed by customers. Its business expanded to Canada, America, EU and other countries and regions. In 2017, the total annual revenue of E-Techco group exceeded 1.6 billion RMB. In recent years, through cooperation with famous universities and research institutes at home and abroad, E-Techco (Qianhai AnyCheck) introduced the top level talent teams at home and abroad, and continued to carry out continuous innovative exploration and industrial application in the field of artificial intelligence and intelligent medical treatment. Independent research and development of TCM Constitution identification instrument, disease prevention and service system of products and services, is a combination of traditional Chinese medicine theory and information technology with artificial intelligence technology, the application in the field of Chinese medicine, Chinese medicine to improve the digital information and intelligent level has made a major breakthrough innovation, which has been fully recognized by the State Administration of traditional Chinese medicine, China Academy of traditional Chinese medicine, Chinese Medicine Institute and many other leaders and experts. In addition, E-techco Group R & D team will artificial intelligence combined with health care, using conditional random fields (CRF), recurrent neural network (RNN), convolutional neural network (CNN) and other deep learning algorithms, to solve the Natural Language Processing (NLP) of the named entity recognition, modification, text classification problems.To construct the medical knowledge map, combined with the related decision algorithm and model applied to clinical data center (CDR), electronic medical records system (EMR), clinical information system (CIS), health management system (PEIS), the clinical decision support (CDSS), medical record retrieval and analysis (CP), mining and application medical data (DATA MINING), Such innovative applications are leading the way across the country and even around the world. E-Techco has always attached great importance in self-innovation ability improvement and intellectual property accumulation and protection. According to the latest intellectual property right data, E-Techco has applied 3060 all kinds of intellectual property rights, including 2324 applied patents, including 306 software copyrights, 33 trademarks, 13 domains, 384 other IPs; 1450 authorized intellectual property rights, including 721 intellectual property rights authorizations, 306 software copyrights, 26 trademarks, 13 domains, 384 other IPs. In order to reward E-Techco for its contribution in technological innovation, Shenzhen Intellectual Property Office, Guangdong Provincial Intellectual Property Office and State Intellectual Property Office have granted E-Techco the Shenzhen Intellectual Property Advantage Enterprise and Guangdong Intellectual Property Demonstration Enterprise, National Intellectual Property Advantage Enterprise honor. Among the results of the 19th China Patent Award just released by the State Intellectual Property Office, two invention patents in the field of smart medical treatment of E-Techco (Qianhai AnyCheck) also won the 19th China Patent Award of Excellence. In addition, in the Intellectual Property Publishing House I Think Tank newly published The Intellectual Property Development Conditions Research Report Of Global Smart Medical Industry. E-Techco Groups affiliated enterprises---Qianhai AnyCheck Information Technologies Co. Ltd. E-Techco Information Technologies Co., Ltd respectively was listed in the world fourth and fifth position in the national intellectual property application ranking list in the global smart medical area. It is the only domestic enterprise entering the top 5 list, the top 3 are still occupied by the 3 overseas company Philips, Siemens, General Electric. Tsinghua University and Shanghai Jiao Tong University ranks the top 20 in the global smart medical patent area, while E-Techco Group ranks the first and second among the domestic peers in intellectual property area. In the beginning of June, in the national awarding ceremony held in Beijing Diaoyutai State Guest House, due to his brilliant contributions in Life-IT, big health and internet medical area, John Zhang was awarded 2017 Annual Innovation 2017 Annual Innovation China Leader, 2017 China wisdom medical brand innovation character, China wisdom medical industry integrity entrepreneur meritorious home Award, and E-Techco was awarded as 2017 Annual Innovation China 10 Leading Enterprise, 2017 China Internet Medical leader brand award, China intelligent medical industry quality and integrity demonstration enterprise award.